Molly Bunder was brought up to believe that a little free food, and a lot of community spirit, go a long way towards making the world a better place. After producing three successful readings for Stone Soup in Scotland, she looks forward to working with Stone Soup in the Midwest. 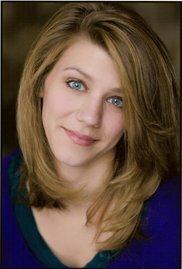 In Chicago, she is a member of the Acting Company at Filament Theatre Ensemble, teaches drama workshops for Third Dimension, and voice and piano for the David Adler Arts Center. In the UK, she has performed in A Mind’s Eye Theatre’s production of A Midsummer Night’s Dream, Stone Soup’s Bill’s Belle’s Brew-ha-ha, the Royal Scottish Academy of Music and Drama’s Hamlet, and as Lord Clifford and the Duchess of York at Shakespeare’s Globe with the RSAMD. While a student at Randolph-Macon Woman’s College, she developed a one-woman show under the direction of Mary Coy (of the American Shakespeare Center) called Shrews, Schemers, and Queens: Unruly Women in Shakespeare.